Visiting Lagoa do Fogo and Furnas will get you outdoors. You'll find plenty of places to visit near Ponta Delgada: Furnas (Parque Terra Nostra & Poca Da Dona Beija). 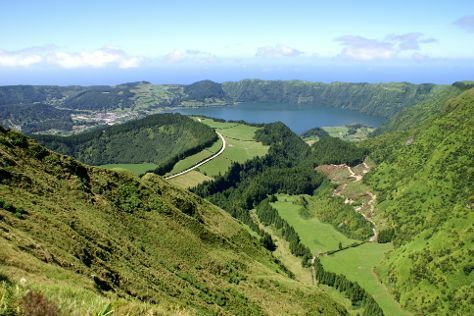 The adventure continues: take in the dramatic natural features at Caldeira das Sete Cidades, explore the fascinating underground world of Gruta do Carvao, tour the pleasant surroundings at Praia de Santa Barbara, and identify plant and animal life at Environmental Interpretation Centre of Caldeira Velha. For other places to visit, reviews, and more tourist information, refer to the Ponta Delgada day trip planning tool . Philadelphia, USA to Ponta Delgada is an approximately 11-hour flight. You can also do a combination of train and flight. Due to the time zone difference, you'll lose 4 hours traveling from Philadelphia to Ponta Delgada. When traveling from Philadelphia in June, plan for a bit cooler days in Ponta Delgada, with highs around 24°C, while nights are about the same with lows around 19°C. Finish your sightseeing early on the 9th (Sun) to allow enough time to travel to Porto. Kick off your visit on the 9th (Sun): take in the architecture and atmosphere at Clerigos Tower, then take a stroll around Palacio da Bolsa, and then explore the activities along Rio Douro. For maps, reviews, ratings, and other tourist information, you can read our Porto travel planner . Traveling by flight from Ponta Delgada to Porto takes 5.5 hours. The time zone difference moving from Azores Time to Western European Time is 1 hour. In June, daytime highs in Porto are 26°C, while nighttime lows are 16°C. Cap off your sightseeing on the 10th (Mon) early enough to travel to Lisbon. Satisfy your inner culture vulture at Alfama and Carmo Archaeological Museum. Get outdoors at Pypas Cruises Lisbon Boat Tours and Lisbon by Boat. When in Lisbon, make a side trip to see Praia de Carcavelos in Carcavelos, approximately 34 minutes away. 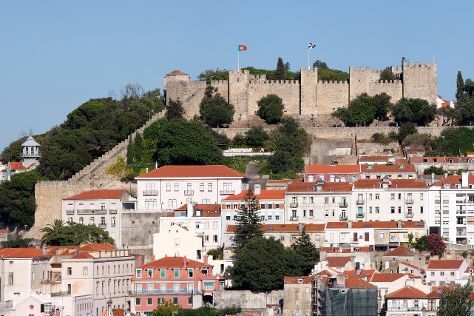 And it doesn't end there: steep yourself in history at Castelo de S. Jorge, pause for some photo ops at Padrao dos Descobrimentos, get interesting insight from Portugal Bike, and make a trip to Praca do Comercio (Terreiro do Paco). To see maps, reviews, other places to visit, and other tourist information, refer to the Lisbon trip site . You can fly from Porto to Lisbon in 2.5 hours. Other options are to take a train; or drive. When traveling from Porto in June, plan for somewhat warmer days and about the same nights in Lisbon: temperatures range from 32°C by day to 18°C at night. On the 14th (Fri), wrap the sightseeing up by early afternoon so you can travel back home.